Yr Wyddfa (Snowdon) at 1085 metres is the highest mountain in Wales, and its beauty dominates the surrounding hills. From the summit, on a clear day, you can see Ynys Môn (Anglesey), Pembrokeshire and even Ireland. What so special about Snowdon? Extreme weather: The summit temperature ranges between – 20°C to +30°C, wind speeds can reach gusts of 150 mph, over 5 metres of precipitation is received annually and there is often snow on the mountain for six months of the year! The most popular mountain in the UK: Snowdon attracts nearly 500,000 walkers every year; and the Snowdon Mountain Railway which goes all the way to the summit carries an additional 110,000 passengers annually. The train runs from April to October but doesn’t run in bad weather. Rare plants and animals: Much of Snowdon is a Site of Special Scientific Interest (SSSI) and National Nature Reserve (NNR). The rare and fragile Lloydia Serontina or Snowdon Lilly is found on the steep cliffs facing the north/north east on poor soil – and Snowdonia is the only place it is found in the UK. Other special plants and creatures that are protected include the Snowdon Beetle and Purple Saxifrage. Refreshments on the summit: There’s been buildings at the summit of Snowdon since the 1820s, though the ramshackle huts of that time are a far cry from the Hafod Eryri – the existing summit building – which has been designed to blend into the landscape and withstand the extremes of summit weather. Hafod Eryri is run by the Snowdon Mountain Railway so if the train isn’t running due to bad weather Hafod Eryri remains closed. 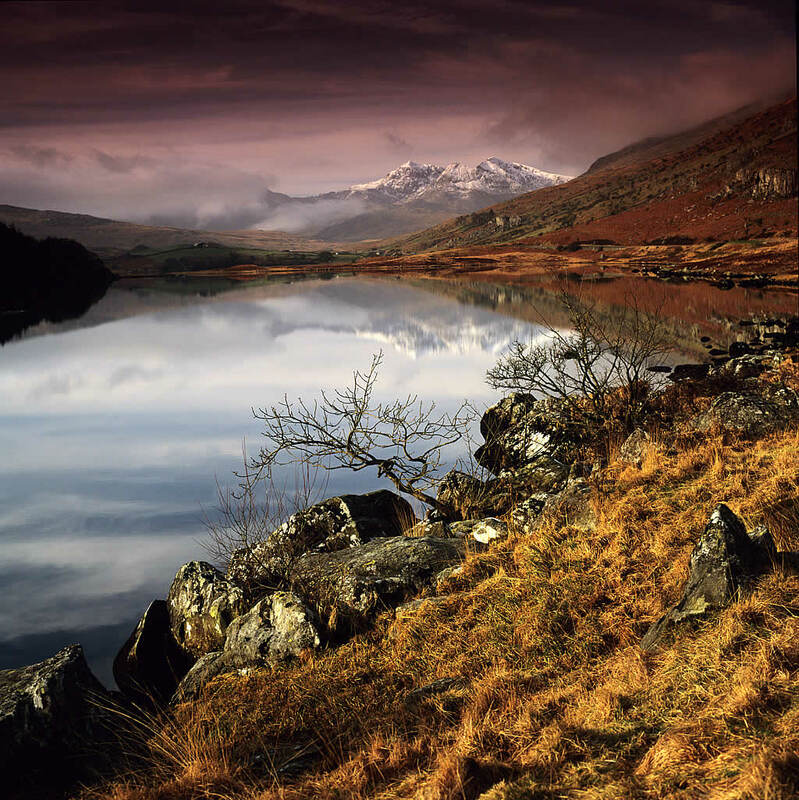 Volcanos and fossils: Snowdon stands by itself in Snowdonia—it can be seen from afar and is a dramatic feature. There are several types of rocks to be found on the summit—sedimentary stones and igneous/volcanic rocks. Some of the rocks along the summit even contain fossils of sea creatures! Snowdon itself is a pyramidal peak. Glaciers eroded three sides forming this characteristic shape, leaving two arêtes – Crib Goch and Lliwedd above cwm/corrie formations with hanging valleys above the main valley glaciers below. An ancient burial mound: The welsh name for Snowdon ‘Yr Wyddfa’ (Gwyddfa) means burial place, and according to legend, Rhita the Giant is buried under the summit cairn. Take exit 11 off the A55. At the roundabout take the 1st exit for Bethesda. At the next roundabout take the 2nd exit for the A4244. After about a mile you’ll pass a petrol garage on your left, note that this is the last garage before getting to Llanberis if you need fuel. At the t junction turn left for Llanberis. Continue until you see the lake on your left. See below for more details on parking in Llanberis. As above but keep going when you see the lake on your left. You’ll come to a mini-roundabout, head straight over this and continue to follow this road through a village called Nant Peris and up through the valley until you get to the top of the pass (about 6 miles from Llanberis). Pen y Pass car park is on the right hand side at the top of the pass. There is no vehicular access from the mini-roundabout on the main road up the narrow tarmaced lane to the start of the Llanberis path up Snowdon, so you will need to park in one of the many car parks in Llanberis (£4-8). Pen y Pass car park (£10) is normally full after 7:30am in the summer months and even drop-offs here during busy times can be problematic. Further parking is available either to the east, at Pen y Gwryd (£4), or to the west in Nant Peris (£4). The Sherpa shuttle bus service runs every half hour or so during busy times, between all three car parks and tickets for the bus are £1-£1.50. There is also a footpath connecting Pen y Pass and Pen y Gwryd which takes an additional 20 minutes to walk. Please read our general advice on parking. Please take all litter away with you, including fruit peel and apple cores. You may only have a bin bag full but with over 30,000 people taking part in the Three Peaks Challenge each year it soon adds up and disposing of dumped waste is extremely costly for the National Park and local communities. Note that there are no bins at all at Pen y Pass so you will need to take your rubbish away with you. This is very limited on the mountains and there is no phone signal at Pen y Pass. There is a payphone in the building at Pen y Pass. Please leave the toilets as you found them and take all litter and clothing home with you. There is a growing problem of people using Snowdon as a giant public toilet, so make arrangements for a toilet stop before you head up the mountain! There are toilets in the Hafod Eryri summit building but the building is closed during winter months and in bad weather so cannot be relied upon. Beran Service Station, Deiniolen, LL55 3NF. London Garage Service Station, Cwm y Glo, LL55 4DE. Pen y Pass – Bwtri Café. Snowdon – Halfway House Cafe, half-way up the Llanberis path; Hafod Eryri summit cafe (remember these cafes are closed during winter and when there is bad weather). Encouraging everyone involved to stay locally and buy goods locally will ensure the sustainability of charity events on Snowdon in the future. Please feel free to use one of the many fantastic local pubs/cafes to celebrate your success! There are a number of cash points in Llanberis. Booking a local guide can take a lot of the stress out of organising and they will have excellent local knowledge of the area. For more information on local guides click here. The weather in Snowdonia can change rapidly and turn a great experience into a very bad one. Check the Met Office mountain weather forecast for Snowdonia – for the most accurate forecast check the Met Office Forecast the night before. Good footpaths are a way of protecting the land on either side of the path from erosion caused by the thousands of feet that walk up the paths to the summit each year. This is land where many rare plants grow that need to be left alone. A footpath team. 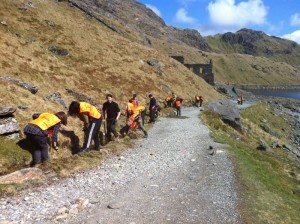 wardens as well as hundreds of volunteers maintain and repair the paths on Snowdon to a high standard but sometimes problems occur. Drains that carry water off the paths are sometimes stuffed with rubbish or can be blocked with debris. When drains are blocked, huge amounts of water can flow onto the path and do huge damage to the careful work carried out by the footpath team. Wild or feral goats are a problem in some areas. Due to mild winters and the fact that there’s more grass (and less sheep, so less competition) the numbers have increased dramatically. They are a problem as they eat everything and can undo the work that the farmers and conservationists are doing. They can climb trees to get at the leaves. They’re counted every year so that their numbers and location are known. Please consider helping out by volunteering and/or donating.